Hey Google, what's new with the Assistant at CES this year? This week, we’re at the Consumer Electronics Show in Las Vegas to showcase what’s in store for the Google Assistant in 2019. By bringing the best of Google services and AI to the Assistant, we're focused on building the most helpful digital assistant when you’re at home, in your car or on the go. If you’re at CES, stop by the Google Assistant Playground (Central Plaza-1, the outdoor space located directly in front of the Las Vegas Convention Center). Today we’re introducing a preview of Google Assistant Connect, a platform for device manufacturers to bring the Google Assistant into their products in an affordable and easy-to-implement way. Connect uses our existing smart home platform to expand to new device types while making device setup and discovery simple for people. Assistant Connect creates opportunities to bring different types of smart devices to the market. For example, a partner could create a simple and inexpensive e-ink display that continually projects the weather or your calendar, while using Assistant Connect to deliver content from your linked smart speaker. The Google Assistant handles the higher-order computing—knowing what’s on the calendar, checking for updates, and so on. We’ll have more to share about Assistant Connect and how device makers can gain access to the technology later this year. For device manufacturers who want to learn more about how to integrate Assistant Connect, fill out this form. 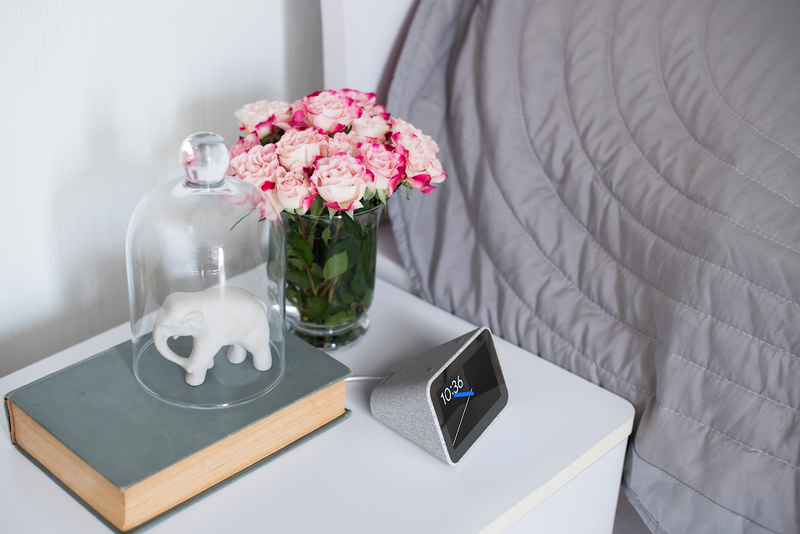 With Lenovo, we're helping you manage your morning and evening routines with a new Smart Clock. With its 4-inch touchscreen, you can see alarm suggestions based on your daily routines, gently wake up with auto-adjusting screen brightness and animations, and control your smart home devices. The Lenovo Smart Clock will be available this Spring for $79. At CES, Whirlpool also previewed the new KitchenAid Smart Display with the Google Assistant, which guides you through cooking recipes from Yummly and simultaneously controls your smart home devices. Featuring a 10-inch display, the KitchenAid Smart Display is water resistant, for when things get really messy during cooking. Listening to music and podcasts is one of the most popular ways people use the Google Assistant, so we’re bringing the Assistant to the Sonos One and Sonos Beam (earlier speaker models will be updated to work with the Assistant). With the Assistant built in, you’ll be able to control your favorite music, podcasts and radio stations from all over your home without ever picking up your phone. Later this year, the Assistant will work with even more popular media and entertainment devices, including TVs from Samsung. You’ll be able to use your voice to turn on the TV, change volume and channels, and switch between inputs. DISH’s Hopper family of receivers will also now have the Google Assistant built in, so you can search for content based on channel, title, actor or genre, as well as check the weather or control other connected devices in your home, using your DISH voice remote. And, this week at CES, our partners launching and showcasing Android TV devices with the Google Assistant include Sony, Hisense, Philips, TCL, Skyworth, Xiaomi, Haier, Changhong and JVC. Several of these devices will be enabled with far field microphones that allow the Assistant to pick up your voice even with noise in the room or on the TV. The Assistant works with over 1,600 home automation brands and more than 10,000 devices, giving you more control over the devices and appliances in your home. At CES, we’re working with even more brands to launch new smart home devices this year, including select Whirlpool ® connected appliances, GE’s smart microwave and August security products. And there’s a new Assistant feature with Philips Hue that helps you wake up. Simply turn on “Gentle Wake Up” and the lights in your bedroom simulate the sunrise 30 minutes before your morning alarm goes off, to help you wake up and feel more energized. Starting to roll out today, the Assistant can help you navigate in Google Maps for Android and iOS. With just your voice, you'll be able to share your ETA with friends and family, reply to text messages, play music and podcasts, search for places along your route, add a new stop and auto-punctuate your message. On Android, the Assistant works with messaging services from the following providers: SMS, WhatsApp, Messenger, Hangouts, Viber, Telegram, Android Messages and more. And when you’re driving, the Assistant automatically calculates your ETA from Google Maps if you want to send your arrival time to friends. Just say “Hey Google, take me home,” to open Google Maps and get help from your Assistant on your journey. We’re also working with Anker and JBL to build the Assistant into car accessories. Anker Roav Bolt and JBL Link Drive plug into your car’s socket, so you can connect your phone to your car’s stereo via Bluetooth or AUX. Once the accessories are connected in your car, you can use the Assistant hands-free, without having to unlock your phone. These accessories simplify audio input/output and allow the Assistant to hear you clearly, even if there’s loud music or conversations happening. Also previewed at CES is the HumX by Verizon, another car accessory with the Google Assistant built in that lets you pull your vehicle’s diagnostics with just your voice. One example of the innovation that Android brings to OEMs and users is the Google Assistant that's built into more than 1 billion devices, including Android phones. The Google Assistant can be helpful throughout your day on Android devices, whether you are on the go, in the car or at home. There's a lot to keep track of when you're traveling, from your flight confirmation number to the address of your hotel. 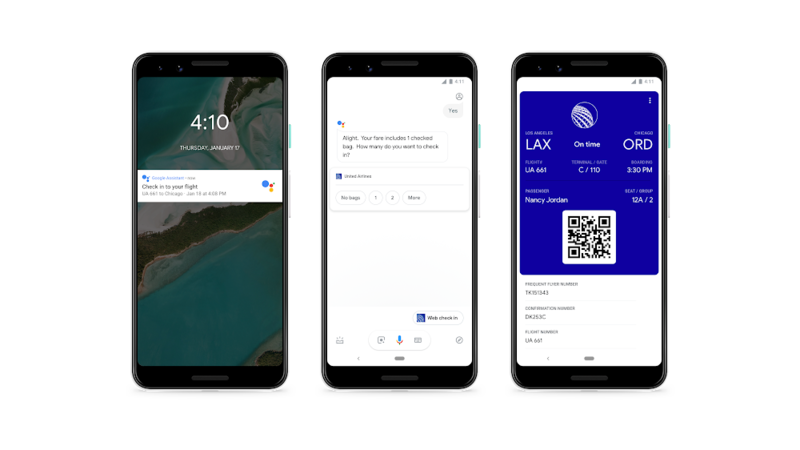 Soon, you’ll be able to check in to your flight (starting first with domestic flights with United Airlines), save and retrieve your boarding pass, all with the Google Assistant on Android or iOS. Just say, “Hey Google, check in to my flight”—there’s no need to remember your confirmation number. The Assistant will also proactively notify you when your flight is ready for check-in. And if you know where you want to stay, you can book a room using the Google Assistant with partners like Choice Hotels, AccorHotels, InterContinental Hotels Group, Priceline, Expedia, Mirai and Travelclick - an Amadeus company. After opting-in through your settings, the Assistant can respond to you even when your Android phone is locked. You can ask your Google Assistant to show restaurants nearby, set up and dismiss alarms, schedule reminders and timers without unlocking your phone. You can also opt in to see answers to personal queries, like traffic updates to work or calendar updates. Currently available for Pixel users, this feature is coming to all Android devices in the next few weeks. Speaking a different language no longer has to be a barrier to having a good conversation. With Interpreter Mode, a new feature rolling out over the next few weeks on Google Home devices and Smart Displays, you can ask the Google Assistant to help you have a conversation in dozens of languages. 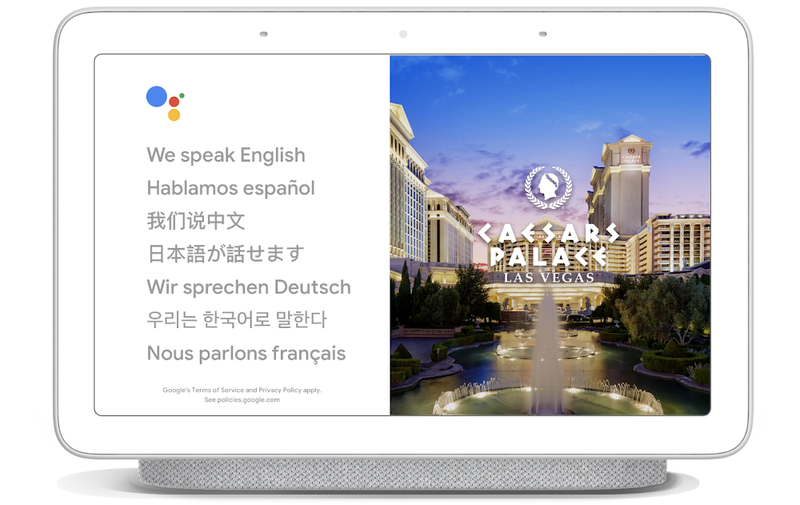 Just say “Hey Google, be my French interpreter” to start Interpreter Mode and get real-time spoken and (on Smart Displays) written translation to aid the conversation. We see this technology expanding to more places—it could help you check in at a foreign hotel or help you understand the bus schedule. We’ll be piloting Interpreter Mode this week at CES at the concierge desk in Caesars Palace, and at the Hyatt Regency in San Francisco and Dream Downtown in New York City. Stop by any of these places to try it out! Phew—that was a lot! We’re looking forward to showing you our vision for the Google Assistant in the home, car and on your phone this week at CES. Stop by our Google Assistant Playground (Central Plaza-1) to see all the new ways the Assistant can give you some help throughout your day.